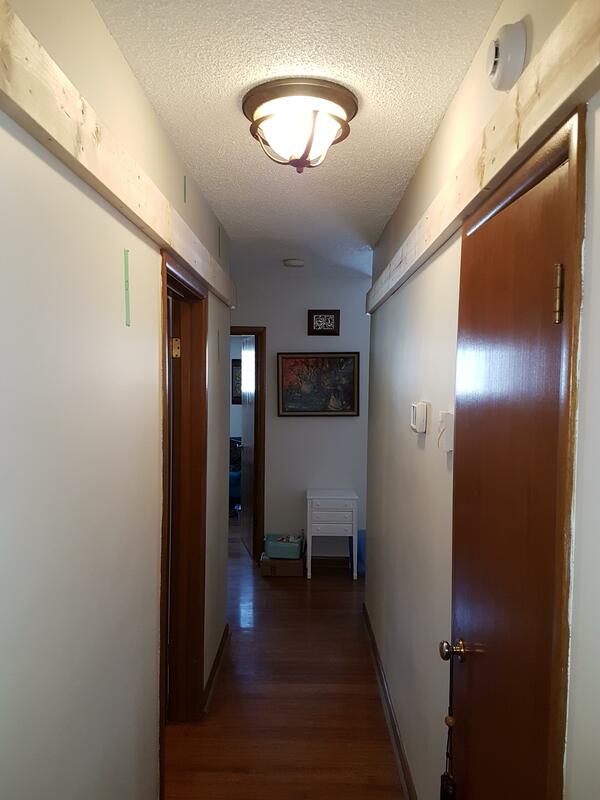 I am installing a series of pull-up bars all the way down my hallway, kind of like really spaced out monkey bars, and would like some advice on my proposed design, b/c I have zero experience with construction, and I want to make sure this is safe. These bars will need to hold the forces of an 82kg (180lb) person swinging on them and between them. This seems to hold really well and supports my weight comfortably. Those are 0.25" holes in the base of that flange. These flanges will be holding the steel tubes that will span the width of the hallway. My concern is that I cannot find definitive info about the shearing force the lag screws can withstand when used with the 2x6 SPF lumber, and I am concerned that there's only 1-3/8" of wood that will be holding the screws. There'll be 4 screws per side, but this still seems a little sketchy to me, considering that I plan to swing on these bars. My best idea so far is to use 1 long lag screw, and 3 short ones per flange. 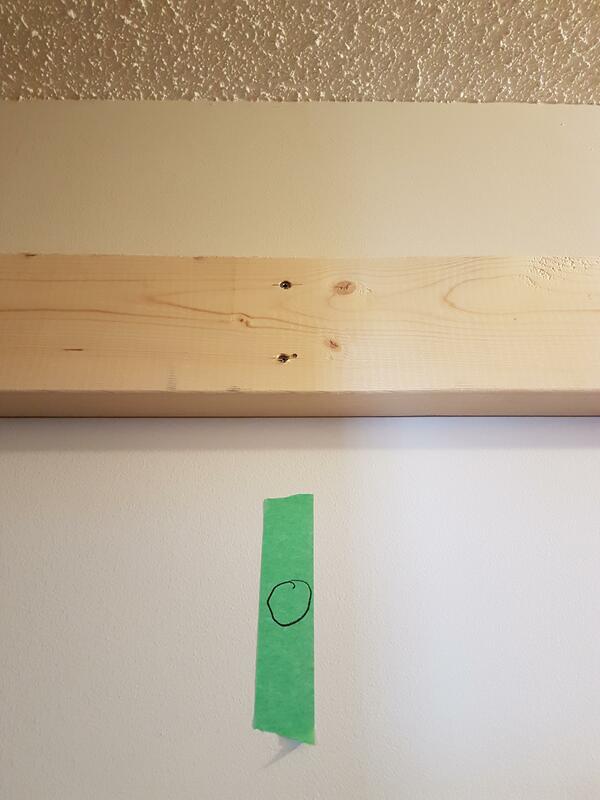 The long one goes into the stud in the top hole, so the existing deck screw above it shouldn't interfere with the strength of the lag screw (which is likely not true for the bottom hole, where the deck screw would be right under the lag screw, right?). My secondary idea is to use small 2x6 sections to double-up the wood where the bars attach, thus giving the lag screws 2-3/4" of wood to bite into, but I'm not sure whether this is necessary? What do you think? Will this hold? Any advice would be much appreciated! 4-each on each end of 1-1/2"x #12 screw is plenty to hold the body weight of a hefty adult male. No need for second layer of lumber. No need to extend through the 2x6 into the stud. Your 2x6 needs to be secured to every stud, 16" on center, with at least 3" construction screws; not sheet rock screws. The screws you show from Lowe's would be a good choice for the flanges. They don't need to be that long. Predrill your holes to the size of the screw shaft, not the thread diameter. With predrilling the screws will hold with more strength. Honestly, I'd think that 4 of any kind of decent screw into the 2x would be perfectly sufficient. If you want to be a little extra sturdy, use the Lowes lags (I have a professional disinclination to everbuilt). Since you've got a stud underneath, a long screw that goes all the way into the stud can't hurt, but wouldn't be an absolute must in my view. If you go for the lags, predrill so you don't split the 2x. I think the four screws properly sized will be fine, but it wouldn't hurt to use stainless for additional strength. If you wanted to really go over the top, put a layer of plywood on top of the 2x6 with holes the size of the flanges in the plywood. The flange will be on the 2x6, recessed in the plywood. I have set up bars at gyms on a similar surface. Depending on how jerky you are going to be and your weight/strength, 2" screws might work... for a while. The problem is the pull up is such a full body movement that there is quite a lot of torque meaning that the plate is going to get moved back and forth. You need to notch out the flanges in the wood. By going 1/4-1/2" into the wood and recessing the flanges in the hole you are giving the exterior of the flange a wall instead of relying solely on the screw, which will loosen over time. It would be even better if the bar itself could also be recessed into the wood. Meaning a hole for flange and a deeper/smaller circumference one for bar. You have a logistical problem that neither you or other people have identified. You are not using flanges that open or close. So how do you suppose you are getting your bar to fit (without it being overly loose)? The answer is you need to take the existing frame off the wall and put everything together first then attach framing to wall. Really if done right the flange should be carrying little to no load. The wood should be holding the bars and will last much longer than a flange/screws. Not the answer you're looking for? Browse other questions tagged wood walls screws or ask your own question. How can I remove these screws from shutters? Will this frame support hanging planters? Can I use screws for attaching a ladder to a bunk bed? Screws used for deck - how to replace?